Meriem Ais is a co-founder of the Algerian Cultural Collective (ACC) UK. 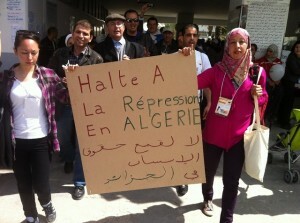 Two weeks ago, thousands of activists gathered in Tunis for the 2013 edition of the World Social Forum, the first time the landmark global event was held in an Arab country. Meriem Ais, Ali Meziane and Amine Mouffok report for Ceasefire on their WSF experience, particularly on the Algerian presence - and absences - at the event and what this presages for the future.